I’ll admit it. I have a soft spot for technology that helps make the world a smaller place. So the prospect of testing out Wayfare, a sort of Tinder for penpals 2.0, was something that was always going to catch my attention. The Tinder reference helps make sense of the app on a basic level, but it is misleading. That’s because it conjures up ideas that the app is some kind of global dating experience. It isn’t. Instead, Wayfare aims to broaden your horizons with a peak into another person’s life in a different part of the world. In fact, Jiho Kang, who heads up the service, told me that he sees Wayfare as a medium that connects you to local tour guides. The app is developed by SK Planet, the digital arm of Korean tech giant SK — a large corporate company that owns national operator SK Telecom among other things. 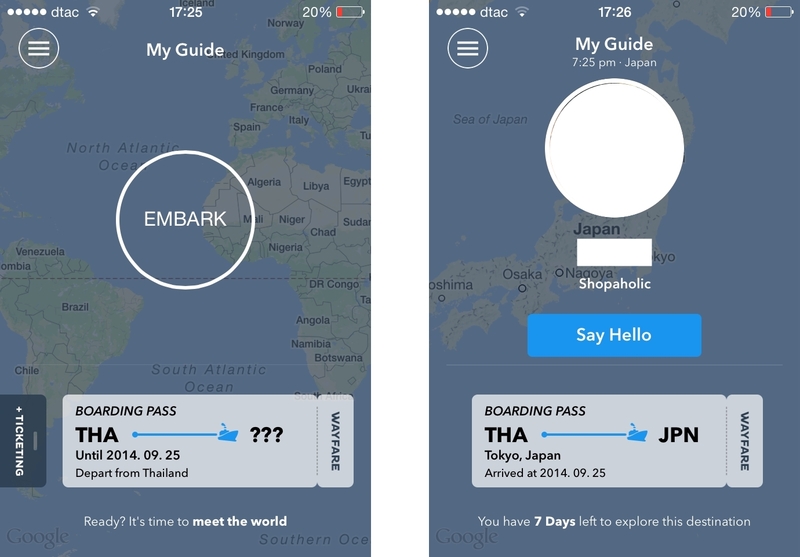 The service is available for iOS and Android, and was initially known as Embark during a beta period. Wayfare essentially pairs you with a new friend for a week. You can only have one friend at a time and you can’t pick the gender of your match — to help cut down on those looking to ‘hook up’. It is possible to get a new match: but only if your first pick doesn’t reply within 20 minutes. The app helps get over such issues by pairing more engaged users together to help foster a strong community. Another anti-Tinder feature is that you can only connect to people who are in different countries to you, which makes that relationship a slow burner, while there’s also a three strikes rule for ‘unsuitable’ content, Kang says. Fill out your details manually or using Facebook, and you’re literally given a ticket and then a match — “guide” — is found for you. This person will be your friend for a week. Wayfare provides you with photo challenges that are designed to help you share various parts of your life and the city with your guide. In addition to providing photos and explanations, you can also send direct messages to your partner during the seven days that you are linked to them inside the app. The app has integrated Google Translate to provide machine translations between users where there’s no common language. Given the often varying locations of users, Kang believes that his team has created a rich experience that can be highly engaging because it doesn’t provide instant gratification like other apps and services. Kang certainly has a good idea of what quality experiences in apps look like. Prior to joining SK Planet, he was a co-founder of Wander, a now defunct app that we wrote about in 2011 which shares plenty in common with Wayfare. The two are not directly linked, but Kang said that he aims to take the best parts of Wander and apply them to the Wayfare experience. Already the app is showing signs of potential. Kang said that, during its beta period, one third of registered users continued to use the app after a month. While the 8,000-odd beta users have shared over 300,000 photos and messages through the service. Kang also revealed that, interestingly, one third of the beta users said that the friendships formed inside the service had influenced their actual travel plans. I.e. these users were deliberately visiting/had visited a country based on a match made by Wayfare. In one case, a married couple actually met through the service — though Kang plays down Wayfare as a potential matchmaking service. For now, the service isn’t making money and that isn’t really a goal. Kang explained that if it gains enough traction, it could be elevated from its current status as a SK Planet side-project — in the style of a Google 30 percent time initiative — to a standalone product, or perhaps even SK subsidiary. Were that happen, he has some ideas about how the app could bring in revenue, but for now the focus is on attracting users and encouraging meaningful experiences inside the app. I’ve only been using the app for a few days, but the proposition is unique enough from other services that I’m willing to give it a shot.